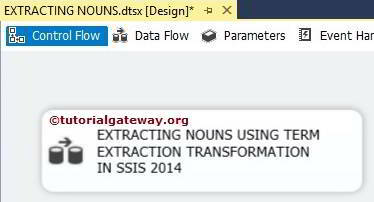 In this article, We are going to show you, How to extract Nouns using Term Extraction Transformation in SSIS. 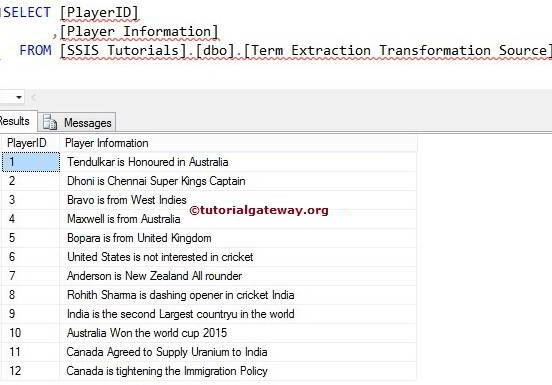 Please refer Extract Noun Phrases Using Term Extraction Transformation in SSIS article to understand, How to Extract Noun Phrases from the Source Data. TIP: Before reading this article, Please refer Term Extraction in SSIS article for the definition, properties and functionality of this Transformation. 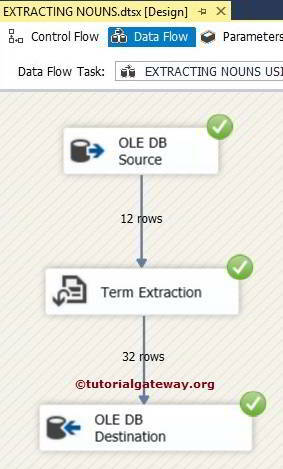 STEP 1: Open BIDS and Drag and drop the data flow task from the toolbox to control flow and rename it as Extract Nouns Using Term Extraction Transformation in SSIS. 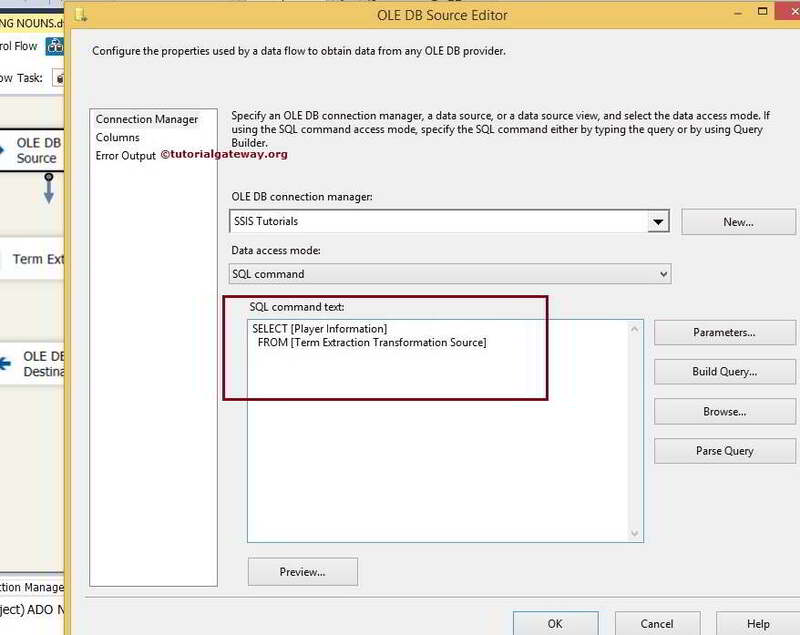 STEP 3: Double click on OLE DB source in the data flow region will open the connection manager settings and provides space to write our SQL statement. TIP: If we don’t want any column then there is no point to add it into your SQL command. 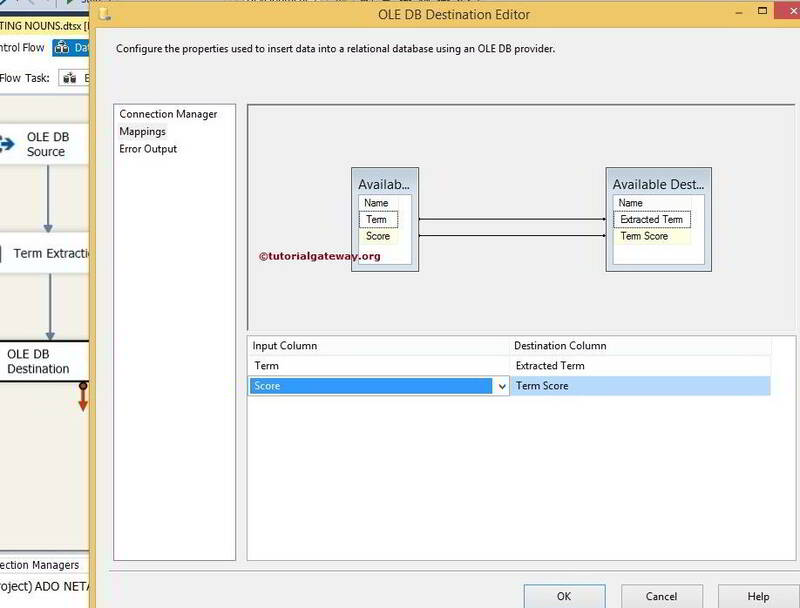 Drag the OLE DB source output arrow on to the Term Extraction Transformation to perform a transformation on the source Data. 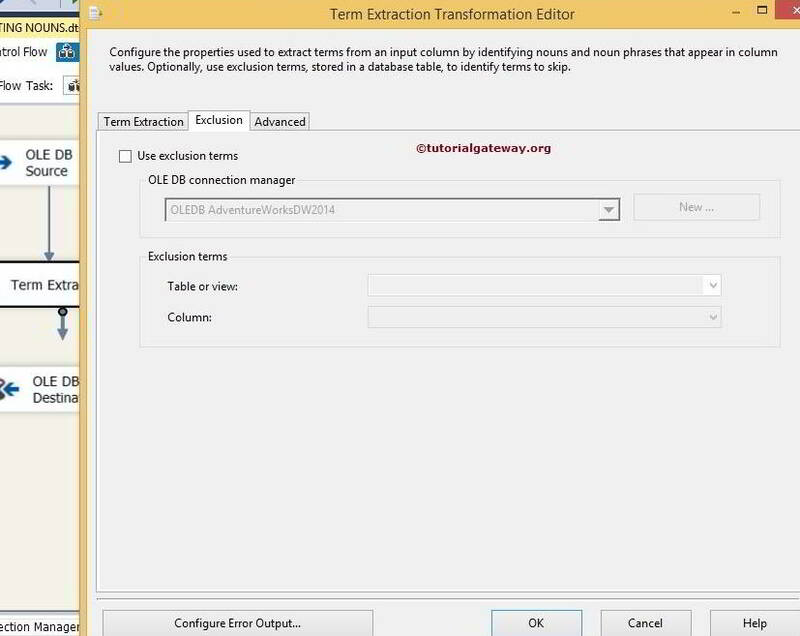 STEP 5: Double click on the Term Extraction Transformation will open the Term Extraction Editor to configure it. Within the Term Extraction tab, You simply need to choose the column you want to use for the Term Extraction from the available input columns. We left the output column names to default Term and Score. 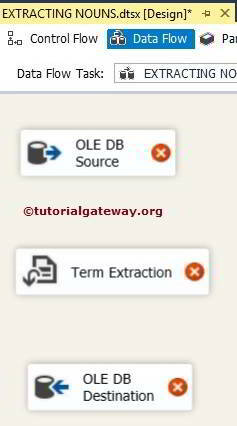 Exclusion Tab: If you want to exclude specific terms during term extraction then, configure this Tab by specifying a column that contains exclusion terms. In this example let us leave this because we want to extract all the Nouns from source data. 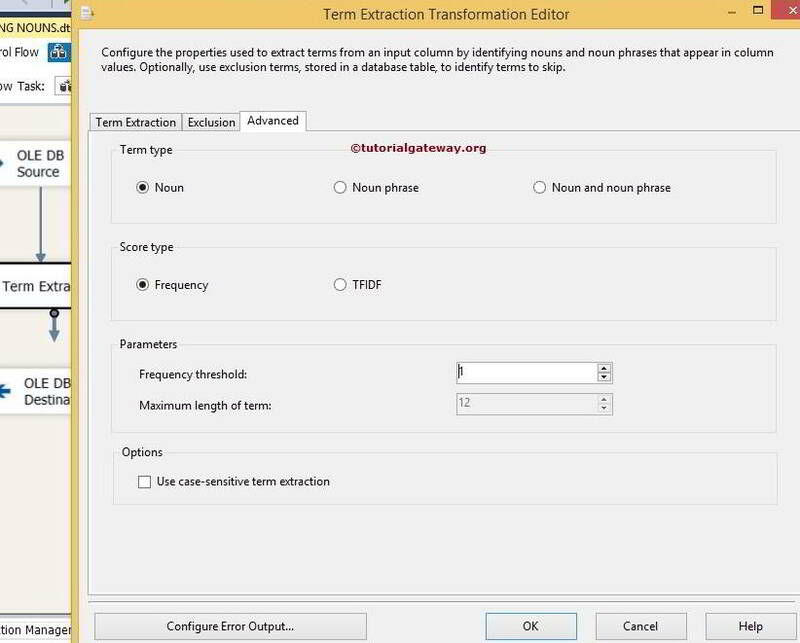 STEP 6: Advanced tab of the Term Extraction Transformation Editor Dialog box is very important to select Term Type, Source Type and Frequency Threshold. 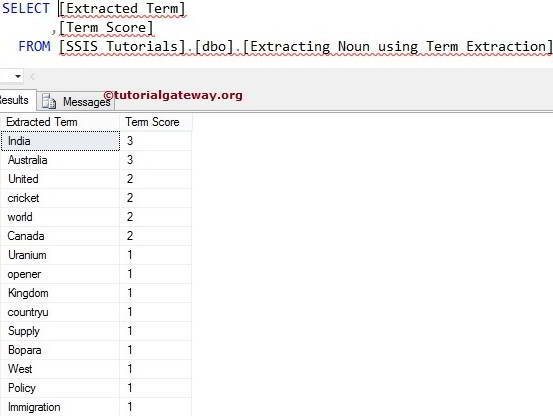 In this example we are extracting Noun only so, we selected Noun as term type and selecting Frequency Threshold as 1. From the below screenshot you can see, there is a warning symbol on the Term Extraction Transformation. It is showing that error output is not connected. 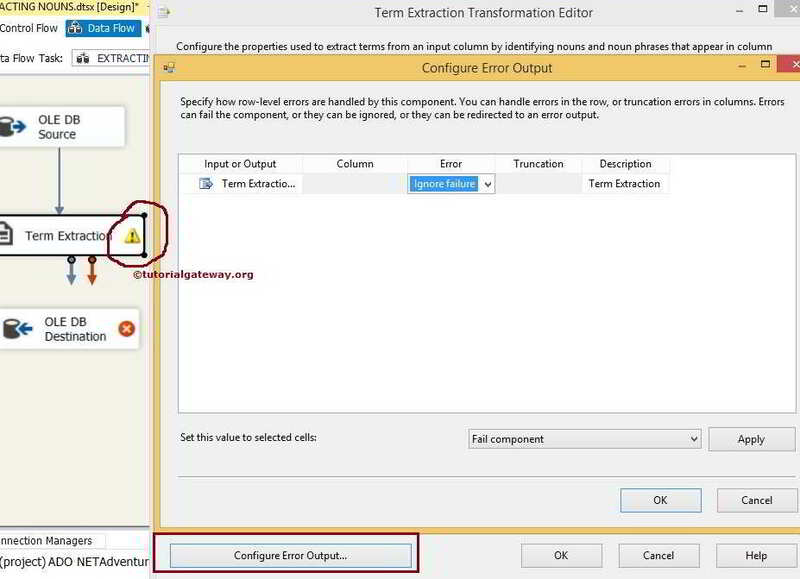 You can remove the warning symbol by configuring the error output of the Term Extraction Transformation. 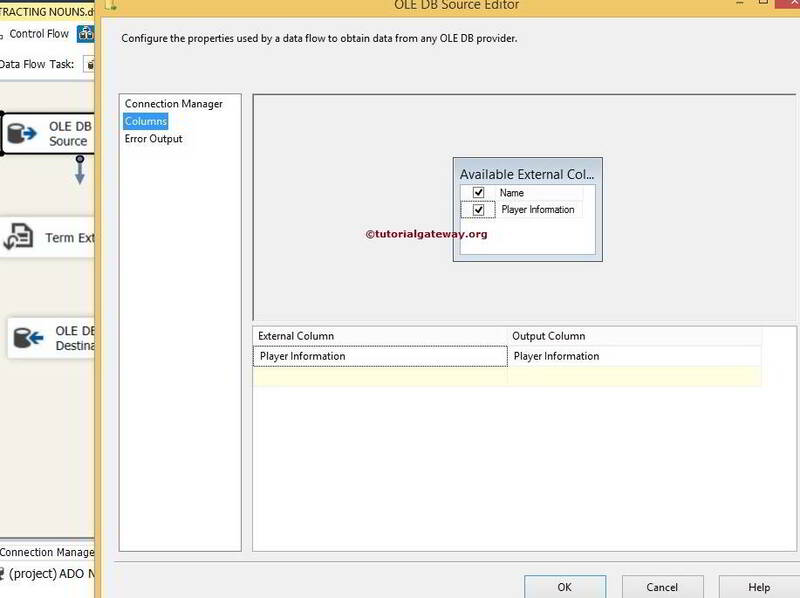 So double-click on the Configure Error Output button will open a new window to configure the error output. 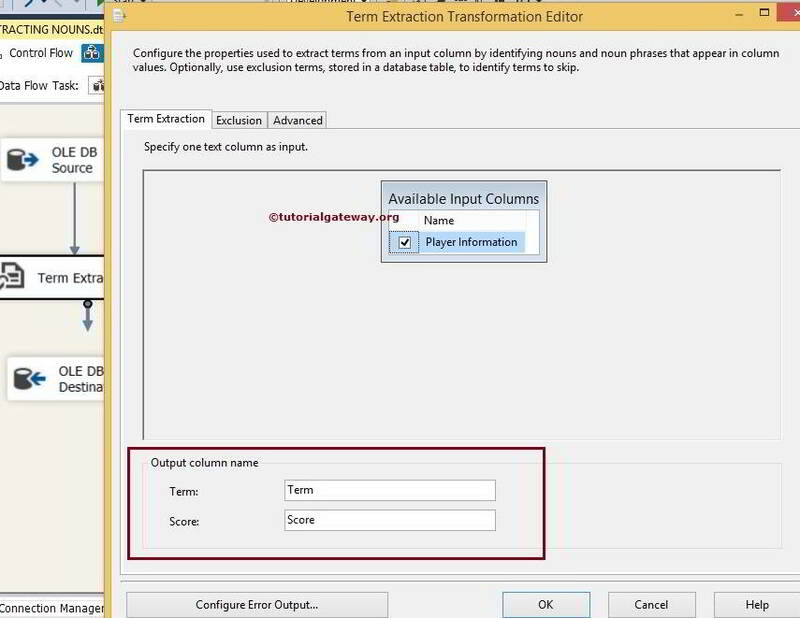 Click ok to finish configuring the Term Extraction Transformation. TIP: If we are extracting terms from any product description then the product name will be repeated number of times. But we don’t require the product name in the output. In these situations, we add these product names table in the exclusion list.